People for the Ethical Treatment of Animals (PETA) protest against fur at a MyungDong shopping district on December 6, 2009 in Seoul, South Korea. 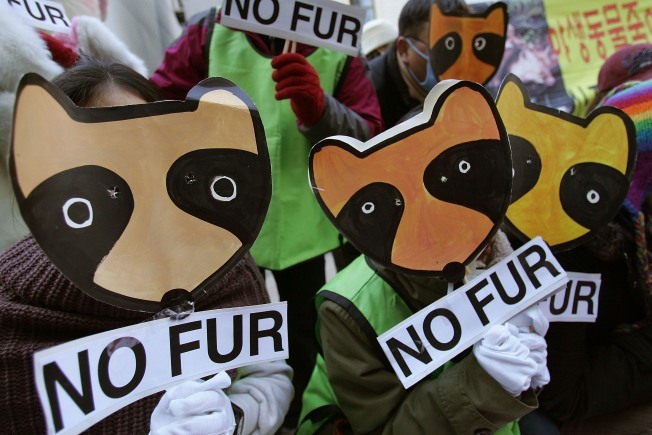 The demonstration was organized by the PETA to protest against the use of fur in clothing. People for the Ethical Treatment of Animals sent a letter to the executive director of the Miss Maryland organization asking for it to stop handing out fur prizes at future pageants. PETA also wants the current Miss Maryland, Carlie Colella, to donate the fur coat she was awarded to PETA’s anti-fur campaign. "Pageants celebrate beauty, and there's nothing beautiful about an industry that rips the skins off animals while they're still alive and able to feel pain," said PETA director and Hagerstown native Colleen O'Brien in a release. "With so many stylish alternatives available, there's no excuse for buying or wearing fur." Colella was crowned Miss Maryland on June 25. Part of her prizes included a $3,000 fox fur donated by Maryland Fur Trappers Inc. The fur trappers association, a sponsor of the Miss Maryland program, has provided a fox fur coat to the winner for 21 years. This is not the first time PETA has raised the issue with the Miss Maryland organization.